The Kansas high school football season is officially underway after an exciting opening night. 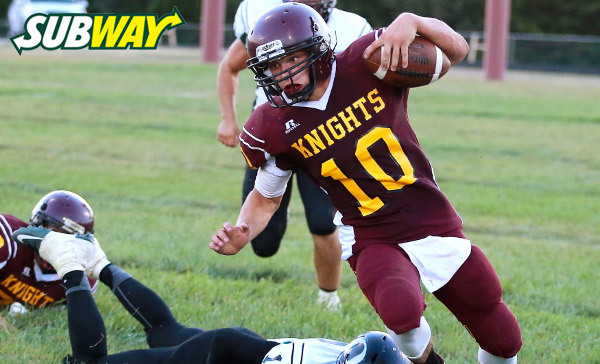 We are thrilled to have Subway on board to sponsor our Friday Fresh Take where we provide our initial reaction to some of the most notable games and performance in the state each week. We’ll start in Victoria for the battle of defending champions from the state’s two 8-Man classifications. Division II’s top-ranked Victoria Knights outlasted Division I’s top-ranked Central Plains Oilers 16-12. The game was a rematch of last year’s season opener won by Central Plains 42-24. Victoria never trailed on Friday in what turned out to be a defensive struggle. The Knights' defense limited Central Plains to 21 carries for 56 yards. Victoria senior Brady Dinkel had two interceptions and two pass breakups. Central Plains struggled with drops passes and senior quarterback Braedan Crites finished only 9 of 26 for 101 yards with a touchdown and two interceptions. Senior wide receiver Hunter Ingham didn't play for the Oilers after a midweek foot injury. Victoria never scored after the 5:03 mark of the second quarter; carrying a 16-6 lead into halftime. The first half ended on a controversial kneel down/ball spike by the Oilers’ Crites with six seconds left at the Knights' 5-yard line. The referees ruled Crites’ knee touched prior to him spiking the ball to stop the clock. The seconds were allowed to expire along with the Oilers’ scoring chance. Crites connected with Bryce Miller on a touchdown pass late in the third quarter to pull Central Plains within the final margin of 16-12. Dinkel finished with a game-high 74 rushing yards on 16 carries. Victoria hasn't lost a home game since Week 2 of the 2012 season. The game of the night occurred in Holton where two of Kansas’ premiere programs played a classic game that lived up to its billing. Silver Lake held on for a 23-22 win in overtime as Arturo Reveles’ point-after-touchdown kick sailed left of the upright leaving Holton that close from forcing a second overtime. It was Reveles that made the crucial kick for just minutes earlier to pull Holton even and force overtime. The Wildcats trailed 16-13 with 1:13 remaining in the game and faced a fourth down and six at the Silver Lake 10-yard line. Reveles drilled a 27-yard field goal through the uprights for the tie. Silver Lake scored first in overtime as quarterback Cole Baird hit Logan Wolfley on an 8-yard touchdown pass and a 23-16 lead. On Holton’s possession, Spencer Baum scored from five yards out to pull Holton within an extra point, but Reveles’ PAT sailed left. Baum rushed for two touchdowns on the night and hauled in a 41-yard touchdown pass from Justin Pool on a halfback pass. Similarly, Baird had a hand in all three touchdowns for Silver Lake. The senior returned the opening kickoff of the game for a touchdown to give the Eagles an early 7-0 lead. He also rushed for a 30-yard score and connected with Wolfley on the 8-yard score in overtime. In the 2014 opener between the two teams, Silver Lake shut down the Holton wishbone attack in claiming an 18-7 win. Yes, you read that last headline correctly. The top four teams in Class 5A all lost on Friday night causing full blown chaos for next week’s rankings. In the key ranked match-up in the classification, No. 5 Mill Valley outplayed No. 1 St. Thomas Aquinas in claiming a 38-20 victory. Jaguar quarterback Logan Koch passed for 220 yards and two touchdowns, and added 97 rushing yards and three more scores. Mill Valley wide out Christian Jegen added 150 receiving yards and a touchdown catch. As impressive as the Mill Valley offensive performance, the Jaguar defense forced three turnovers and held Aquinas to just 20 points. Further down the poll, defending 5A champion Bishop Carroll was upset by Wichita Northwest 31-24 on Friday night. The second-ranked Golden Eagles fell victims to an all-around outstanding performance by Northwest quarterback Kevin Folsom. Folsom passed for 225 yards and a touchdown and added 115 yards rushing and another score. His 3-yard touchdown pass with around 20 seconds remaining in the second quarter gave the Grizzlies a 17-14 lead at the intermission. The teams traded touchdowns in the third quarter in the form of a Carroll 1-yard score from Adam Theis and a 28-yard run by Northwest’s Jahlyl Rounds. Bishop Carroll pulled even early in the fourth quarter on a 37-yard field goal by Diego Lopez. But Rounds would put the Grizzlies up for good with a short touchdown run with 2:25 remaining in the game. The Carroll offense would get a last possession, but would stall on downs at the Northwest 44 yard-line. The win was the Grizzlies’ first over Bishop Carroll in ten years. Third-ranked Salina South also fell victim to Friday’s 5A curse. The Cougars managed only a fourth-quarter touchdown in a 14-7 loss to McPherson. McPherson forced a pair of early turnovers that each led to touchdowns for the Bullpups. Staked with an early lead, the Bullpups turned to a ball-control offense led by Noah Jirgens. Jirgens answered by rushing for 223 yards on the night. Finally, fourth ranked Blue Valley West had a big challenge on the road at 6A’s No. 4-ranked Lawrence Lions. The talented Lions scored 21 second-quarter points in building a four-touchdown lead by halftime. Lawrence eventually led 35-0 before the Jaguars answered with a pair of touchdowns in the third quarter. J.D. Woods rushed for 105 yards and two touchdowns and caught a long touchdown pass from quarterback Alan Clothier. Blue Valley West found very little success rushing against the Lawrence defense, managing only 37 yards on the night. Buhler and Andale began the season each highly ranked in their respective classifications. Buhler was ranked No. 2 in Class 4A-I, and defending champion Andale opened as the top-ranked team in 4A-II. But despite being highly ranked, Buhler hadn’t beaten the Indians in 25 years. That changed Friday night. Buhler’s outstanding senior quarterback Jace Williams produced 200 yards of total offense and had a hand in two touchdowns as the Crusaders shutout Andale 16-0. Williams rushed for 109 yards and a score and tossed a touchdown pass to Dylan Brown that led to a 9-0 halftime lead. Dillon Engelland added 95 yards rushing and opened the scoring with a 25-yard field goal in the first quarter. Buhler’s defense was equally impressive in holding Andale to just 170 yards of total offense. Congratulations to the Marysville Bulldogs for snapping a 32-game losing streak with a 35-19 win over St. Marys on Friday night. The win was the Bulldogs’ first since a 38-7 victory over Clay Center on September 23, 2011. Marysville finished as the Class 3A state runner-up in 2009 with a 12-2 record. Since that 37-30 loss to Wichita Collegiate in the 2009 championship game, the Bulldogs had gone just 8-38 before Friday’s win. A season ago, Jace McDown rushed for more than 1,600 yards in leading his Columbus Titans to a state football title game for the first time in school history. He earned all-state honors, but after a blowout loss to Andale in the title game McDown and the Titans are focused on getting back. On Friday, Columbus looked to be in mid-season form on the offensive side of the ball as the Titans outscored Chanute, 64-26. McDown rushed for 230 yards on the night and five touchdowns on the night.